Monitor the interior temperature of your refrigerator or freezer with this easy-to-use thermometer. Maintaining proper temperatures in your refrigeration equipment is critical when it comes to food safety. With this thermometer, it's quick, easy, and convenient, effortlessly promoting food safety in your facility. Just install it in your refrigeration unit and regularly check the temperature; this allows you to adjust the unit's settings as necessary. "I really have no complaints about this. It's good if you work in a commerical environment or need one for your fridge at home. Good price." 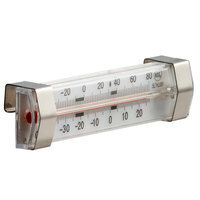 For your convenience, this thermometer easily sits inside your equipment, or mounts to its interior. 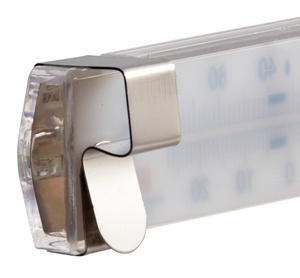 The latter installation method is made possible by the two clips attached to the thermometer's back. 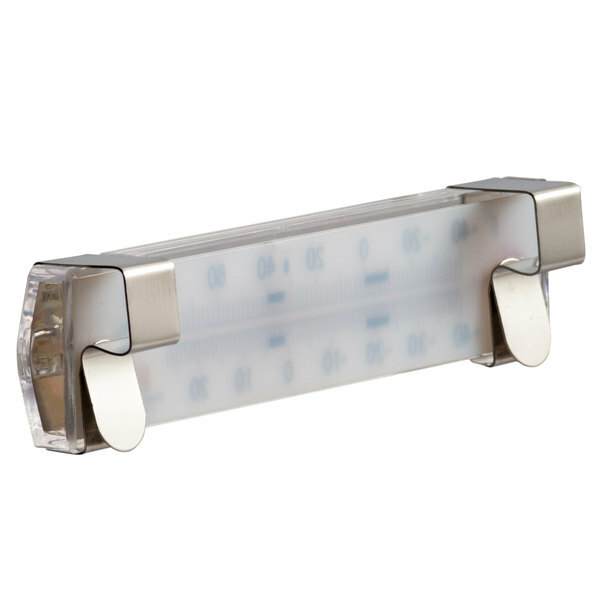 These easily and quickly clips on to the unit for secure installation. Inside the thermometer is a non-toxic spirit to ensure safety in the case of breakage. It's also protected by a shatter-proof lens, which won't send tiny shards into food and cause physical contamination. Allowing for usage in both freezers and refrigerators, the thermometer features a wide temperature range from -40 to 80 degrees Fahrenheit. As a result, it can be used to establish consistency throughout your kitchen; just install it in your wide variety of refrigeration equipment! At a quick glance this gage tells you weather u are in compliance or not. I usually install it at the warmest part of the freezer, which is the interior of the door at eye level. 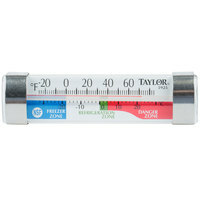 These thermometers come in handy in any situation and are priced very nicely. Suction cups don’t seem to hold very well, but these can also be hung up. Don’t forget that health inspector checks for the littles things! For this price and quality. Why not just get a few extra to have on hand in case someone happens to damage one? Awesome product! We have purchased one of these for each cooling space we have. They are very effective and dependable. Well made, strong and sturdy. Highly recommend. Been using this for about a month and have had no issues. Straight forward design, it provides an inexpensive way to appease health inspectors for monitoring the temp of ice, which I personally find silly. I love these fridge/ freezer thermometers. They have suction cups if needed so attach to the side walls. It's important to have one in each fridge and freezer and these are great quality and look nice too. Decent quality thermometer because of the suction cup design that keeps it out of the way. It is just perfect for what it was intended. Good quality tube thermometer. This thermometer has text that is slightly less clear compared to the Taylor thermometer, but it still works just as well and is a fair bit cheaper. These are great for any reach in freezers/fridges in the restaurant! Very easy to read and sticks on well. Nothing to complain about. I keep it on the side of my freezer and have no issues with the suctions or the thermometer. 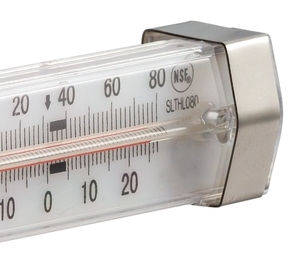 There are many different kinds of thermometers out there, but I really like these. The conveniently hang on the freezer shelves out the way of the product and are easy to read. These are great thermometers - we use them in our glass coolers, the edge clips can be flipped along with the suction cup, so you can 'reverse' mount it and see the temp through the glass door - so you don't need to open the coolers to check temps. These are NSF and easy to read. I love how big they are. My only complaint is that the stick plastic part doesn't hold to my fridge. I really like this thermometer. It has the food safety zones for hot holding, thawing and freezing. The biggest difference with this one and others is that the glass fogs but doesn't frost so you can't read it. The suction cups didn't stick to my cold freezer walls so i just lay it on the shelf. from what i can tell so far, this is a pretty handy thermometer. the suction cups work decently well but do come loose randomly so that can be a little annoying. otherwise it works well. Good thermometer for any kitchen. Sticks on with 2 suction cups, easy to read, and does not take up much space so you can fit it in the refrigerator where needed. 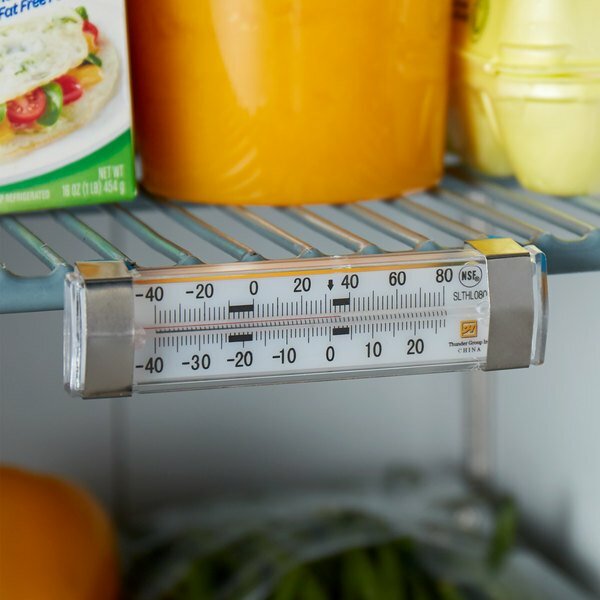 Keeping consistent temperatures in your refrigerator and freezer is important. This is a very low cost thermometer that is easy to read and very easy to use. Ensure you food stays at the proper temperature. Very low cost product. This refrigerator/ freezer thermometer is highly accurate and easy to read. It is durable and long lasting. I would highly recommend this for every single refrigerator and freezer in your establishment.